Temps were in the low 80s, water temp was around 77 degrees. I went out to the trees across the lake looking for crappie. I’ve figured out how to locate them using my fish finder. Just paddle close to any trees or trunks looking for fish. I caught one in about 8ft with a chartruese/blue road runner. I was going to move to another location, but I looked up and noticed around six bass boats in the area. I normally fish during the week with no other boats in the area. I decided to paddle down to walnut creek for awhile. Entrance to the creek is just about a foot deep. Caught a small bass on a road runner just past the entrance sitting next to a log. Caught a large crappie while trolling a small white crank bait. I MISSED a large bass on my small rod using 4lb line and a chartruese/blue road runner. Didn’t find any bluegills with my flyrod, the water must be too low for them. 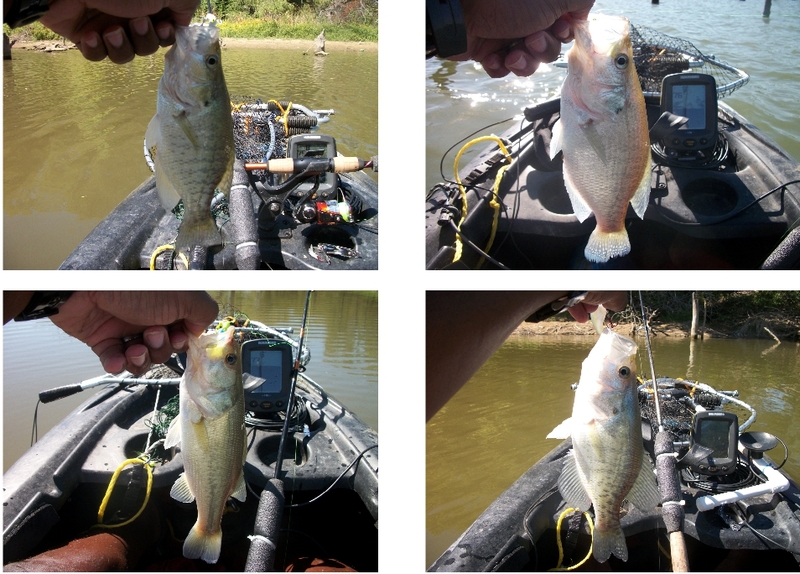 This entry was posted in Bass, Crappie by joebeasley. Bookmark the permalink.